Posted June 10, 2015 by eventreb & filed under Event Rebels Blog. A city of 90 neighborhoods, three rivers and year-round fun! Spend time in Pittsburgh and see why everyone, from the Travel Channel to National Geographic Traveler, is raving. Conde Nast Traveler named Pittsburgh one of the “Top 15 Places to Go in 2015!” They’ve got it all – great food, outdoor adventure, history at every corner, tax-limited shopping, a thriving cultural district, and their familiarity with Stanley and Lombardi makes them a sports lover’s dream. Check out some of the venues that make Pittsburgh such an amazing city for your next event. Children’s Museum of Pittsburgh is a place that delights and inspires children, where they can take off on fantastic flights of imagination daily, and return to earth to splash in a river, hammer a nail and ink a silkscreen. There are many unique and creative spaces to hold your private, family and corporate events at the Children’s Museum. From the elegance of the Big Red Room to the casual fun of their Backyard, you can find a space that fits your style and needs perfectly. Having a big event? Rent the entire Museum and let your guests travel from one fun exhibit to the next! Parents and children will equally appreciate having private access to every level of the Museum. Their experienced event staff will help coordinate all of your arrangements, from equipment rental to entertainment, customized to fit your individual needs. Host a “grand slam” event at PNC Park and experience the exciting atmosphere of the ballpark. The Home of the Pittsburgh Pirates is more than just baseball. With over 10 unique venues to choose from, stunning views of Pittsburgh’s skyline, and world-class catering, PNC Park is ideal for your special event. Their fun and festive venues are perfect for weddings, corporate events, holiday celebrations, birthday parties, and more. Enhance your experience by customizing the event to include alumni and Pirate Parrot appearances, batting practice, & ballpark tours. Round the bases of PNC Park for your next event to create memories that will last a lifetime! Stage AE is Pittsburgh’s most unique multi-purpose entertainment complex. Neighboring Heinz Field on the North Shore, the venue’s atmosphere is aesthetically enhanced by the excitement of Pittsburgh’s cityscape. Located a few blocks away from the Pittsburgh Light Rail “T” and surrounded by ample public parking, guests will experience stress free transportation to and from the venue. Embrace the raw ambiance of Stage AE’s industrial space by utilizing the venue as a canvas to transform and reflect your unique personality on your event. The venue’s flexible event space allows for both indoor and outdoor contemporary design options. Available year round to host and produce special events including weddings, corporate events, fashion shows, Bar/Bat Mitzvahs, festivals, fundraisers, sporting events, school dances, and more. Expect the finest in production and utilize experienced event staff to assist you in planning every aspect of your occasion. Stage AE’s unique versatility allows for countless capacity options. 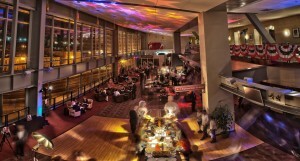 Enjoy cabaret style cocktails and hors d’oeuvres in The Club at Stage AE for up to 400 guests. Utilize the Indoor Music Hall to accommodate up to 450 guests for a sit down dinner, 1500 guests for cocktails and hors d’oeuvres, or 2300 guests for a concert. Incorporate Pittsburgh’s beautiful skyline, showcasing Heinz Field, Point State Park and Mount Washington, into your event by hosting an outdoor event for up to 5000 guests.